The students began their Freedom Ride at the University of Sydney, and continued on to visit Wellington, Walgett, Moree, Boggabilla, Tenterfield, Lismore, Bowraville, and Kempsey. 1. To arouse to public attention the fundamental Aboriginal problems in health, education, housing, etc. 2. To break down social discriminatory barriers to the extent possible by student action. 3. To stimulate the interest of the Aborigines themselves in resisting discriminatory action. Australian Government, local governments and townspeople of Wellington, Walgett, Moree, Boggabilla, Tenterfield, Lismore, Bowraville, and Kempsey. The Freedom Ride brought to light the treatment and living conditions of Aboriginal people in Australia, which was their first objective. Although it is difficult to quantify the amount of awareness raised, it seems that it was a notable campaign since it was the first organized campaign in Australia against discrimination against Aboriginal people. Their second objective, to intervene and cause change in the discrimination they witnessed, was also met, most significantly at Moree. It is unclear if they met their third objective, to encourage Aboriginal people to protest against the discriminatory policies. In 1965, a group of student students at the University of Sydney who were members of Student Action for Aborigines (SAFA) embarked on a two week bus ride through several towns and villages in New South Wales to draw attention to the prevalent discrimination against Aborigines in Australia. This campaign is often credited with directing national and international attention to the ongoing human rights violations against Aboriginal people and leading to the 1967 referendum that approved two amendments relating to Aboriginal rights and status in Australia. In the 1950s, although much of Australia’s population lived in relative comfort, Indigenous Australians were limited in their access to employment opportunities, food, shelter, and healthcare. A report in 1957 by the Western Australian government brought some of these unfavorable conditions to public attention, and in that same year Aboriginal rights activists began petitioning to eliminate all discriminatory clauses from the Australian constitution and make Aboriginal affairs a federal responsibility. In 1958, the Federal Council for the Advancement of Aborigines (FCAA), today the Federal Council for the Advancement of Aborigines and Torres Strait, was formed as the first united body for aboriginal activists. Despite these successes in the Aboriginal Rights movement, there was still much work that needed to be done. The Aboriginal people in Australia lived in unfavorable conditions and still faced de facto segregation in many towns and villages. Student Action For Aboriginals, or SAFA, was born out of demonstrations at the University of Sydney against the treatment of African Americans in the US, and inspired by the nonviolent practices used in the US Civil Rights Movement. Although many Australians supported the US Civil Rights movement, some Australians felt it was hypocritical to only protest against racial discrimination oversees when it occurred in their own backyard. In 1963, the first two Aboriginal students began attending the University of Sydney, which also helped set the stage for an Aboriginal support movement at the university. One of these two students was Charles Perkins, who helped found and lead Student Action for Aborigines. The membership of SAFA represented a range of the university’s student body, and included students from several religious and cultural groups. “To arouse to public attention the fundamental Aboriginal problems in health, education, housing, etc. To break down social discriminatory barriers to the extent possible by student action. In order to carry out these aims, 33 students planned a bus ride through some of the most impoverished areas of New South Wales where they had heard of unfavorable living conditions and possible segregation of Aboriginal people. Although their main aims were to record and survey the living conditions of Aboriginal people, they also planned to take nonviolent action, such as picketing, to protest discrimination and segregation whenever possible. On 12 February 1965, after months of planning and fundraising, SAFA, a group of thirty-three students, as well as a bus driver and an older Aboriginal friend of Perkins, embarked on their two week bus tour. They reached their first stop, Wellington, home of the Wiradjuri people, on 13 February. At every stop, they distributed a survey that assessed the Aboriginal people’s basic living conditions and access to resources, as well as their experiences with racial discrimination. “She kept on yelling, ‘Yes, and you! [...] You have been going with my sister for two years in the dark! What about tellin’ your wife about her! Tell her about the little baby boy you’ve given her!’ The crowd dispersed in minutes as a result of this aboriginal woman’s revelations, and Walgett would never be the same again” (“Commemorating the Freedom Ride New South Wales”). The anger and disagreement of many of the white people in Walgett became especially evident when they followed the SAFA bus out of Walgett with several trucks, one of which intentionally clipped the bus and almost turned it over. On 16 February, the bus arrived at Moree, the home of the Gamilaraay people. 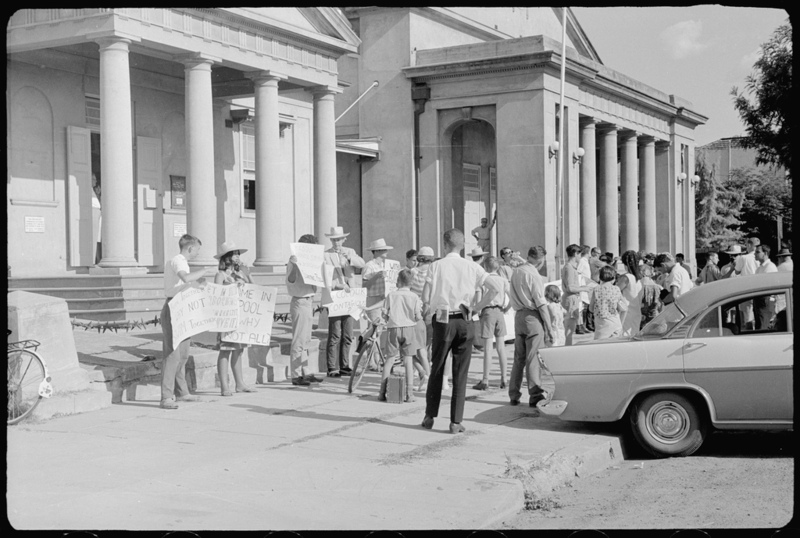 Activists picketed around the town, but this action occurred without much attention from the townspeople. SAFA members visited the local public swimming pool, where they learned that six aboriginal boys were not allowed in because they were not white. SAFA members began picketing the pool to protest its owner's policy of segregation. After about 25 minutes, the Aboriginal boys were granted entry. This prompted the crowd to engage in a discussion about the town’s segregation policies, and the result of the discussion seemed to lead to a vote in favor of removing a clause in the town statue that segregated the pool. SAFA also appears to have sent the citizens of Moree a message informing them of a public meeting that would take place to discuss the treatment and living conditions of Aboriginal people in their town. On 18 February, the students arrived in Tenterfield, home of the Marbal people, and received news of the influence their visit had on Moree, which they had left just two days before: approximately 60 aboriginal students had attempted to enter the swimming pool, and although the owners eventually permitted some to enter, the mayor later announced he would enforce the segregation clause of their town statute. Although the Moree mayor advised on the radio that SAFA should not return to Moree, the SAFA members made the unanimous decision to change their route and return to Moree after visiting the town of Inverel. Between 19 and 20 February, the bus group received news that Aboriginals had been demonstrating for two afternoons against being denied entry at the pool. When SAFA reached Moree, they tried to accompany the children into the pool, with some success. The townspeople began throwing tomatoes and eggs at them and spitting on the SAFA members. It is unclear if and to what extent SAFA members responded with violence, although it seems that it was incited by and mostly continued by the townspeople. However, the mayor eventually agreed to sign a motion to rescind the 1955 statute that allowed segregation in the town, and stated that he also had the support of two other aldermen (elected members of the municipal council). The violence of the protest, however, attracted police forces, who protected both the SAFA members and the Aboriginal children during the protest and stopped several cars which tried to follow the SAFA bus out of Moree. On Monday, 22 February, the bus visited Lismore, home of the Bundjalung people, and on 23 February, they visited Bowraville, home of the Gumbaynggirr people. As in the other towns, here SAFA interviewed the residents of the reserve in order to record and reveal the conditions of Aboriginal people to the general public. They heard reports of job discrimination, segregated eateries, and a segregated theater. The students took action by .... visiting a segregated movie theater which did not allow Charlie Perkins, the aboriginal president of SAFA, to enter. However, they were unsuccessful in getting the local press to help reveal the injustices occurring in Bowraville. The last stop of the bus trip was Kempsey, home of the Dhanggati people, which they visited on 24 February. Here, SAFA attempted to accompany Aboriginal children into the public swimming pool as they did in Moree, but the children, as well as the Charles Perkins and Gary Williams, both aboriginal men, were denied access. However, many members of SAFA, including Perkins, believed this visit was successful because of the press it attracted. Although the immediate and direct effects of this “Freedom Ride” are difficult to assess, this campaign, the first organized campaign against discrimination of Aboriginal people to be held in Australia, gained wide national coverage, such as in the Sydney Herald, Canberra Times, Walgett Herald, and the Melbourne Herald as well as international media coverage. Subsequent accounts of this campaign often attribute The Freedom Ride with providing momentum to other campaigns for the rights of Aboriginal people in Australia, as well as generally raising the public’s consciousness about racial discrimination. SAFA members used tactics of demonstrating and picketing during the Freedom Ride, and it seems that the press surrounding their small actions had a great effect, as the bus tour was covered by national and international news sources. The timing of the campaign often drew parallels between the situation of Aboriginal people in Australia and that of African-Americans in the US. Shortly after the bus tour ended, the New South Wales Aborigines Welfare Board publically announced it would allocate 65 thousand pounds towards improving housing in Moree. Charles Perkins spoke about the Freedom Ride and next steps for the Aboriginal Rights movement at the 1965 Federal Council for the Advancement of Aborigines and Torres Strait Islanders conference. However, it appears that SAFA was mostly finished as a political force by 1966. In 1967, Australia passed a referendum that granted indigenous Australians full rights as citizens. "Australia in the 1950s." Collaborating for Indigenous Rights 1957-1973. National Museum Australia, n.d. Web. 16 Feb. 2017. <https://web.archive.org/web/20170216054603/http://indigenousrights.net.au/civil_rights/the_referendum,_1957-67/australia_in_the_1950s>. Campion, Jessica. "How Aboriginal Activism Brought about Change." Australian Geographic. N.p., 14 July 2014. Web. 16 Feb. 2017. <https://web.archive.org/web/20170216053838/http://www.australiangeographic.com.au/topics/history-culture/2011/07/how-aboriginal-activism-brought-about-change>. "Commemorating the Freedom Ride New South Wales, 12-26 February 1965." AIATSIS. Australian Institute of Aboriginal and Torres Strait Islander Studies, n.d. Web. 12 Feb. 2017. <https://web.archive.org/web/20170216052750/http://aiatsis.gov.au/exhibitions/1965-freedom-ride>. Curthoys, Ann. "Freedom Ride: A Journey to Fight Racial Discrimination." Australian Geographic. N.p., 27 May 2010. Web. 13 Feb. 2017. <https://web.archive.org/web/20170216053054/http://www.australiangeographic.com.au/topics/history-culture/2010/05/freedom-ride-a-journey-to-fight-racial-discrimination/>. "The Referendum, 1957-67." Collaborating for Indigenous Rights 1957-1973. National Museum Australia, n.d. Web. 16 Feb. 2017. <https://web.archive.org/web/20170216054308/http://indigenousrights.net.au/civil_rights/the_referendum,_1957-67>. SAFA. "SAFA Press Release." AIATSIS. Australian Institute of Aboriginal and Torres Strait Islander Studies, n.d. Web. 14 Feb. 2017. <https://web.archive.org/web/20150321134546/http://aiatsis.gov.au/sites/default/files/docs/collections/freedom-ride/student-action-aborigines-organisation-press-release.pdf>.